Please be informed that the below configurations are done on Ingress software, as shown in the accompanying images. However, this can also be applied in TCMSV3 to achieve comparable results, as the configuration is similar with only a slight difference in the interface. The clocking range (only applicable for Weekly and Daily schedules) is used to determine the maximum time that one slot can record before it is considered as the time for the corresponding slot. For example, value for IN is 08:00 and the value for OUT is 17:00 in Clocking Time as per the picture below. If you leave the clocking range blank, the system will calculate the middle time as the range of time to be used as per the picture below. For example, if the IN column in the clocking range is blank, the system will calculate the middle time between the IN and OUT columns. For the example above, the system will use the middle time between 08:00 and 17:00, which is 12.30. Hence, if a user punches in at 12:31 onwards, it will appear in the OUT column in the attendance sheet. By using Clocking Range, you can change the software's default data allocation system as per the picture below. In Clocking Range, insert 15:00 into the IN column. This will prompt the software to overwrite its default data allocation and use the inserted time value to allocate the data. Now, any transactions before 15:01 will fall in the IN column while those transactions after will be automatically assigner into the OUT column. If the employees work according to the work schedule, you may ignore this option. This option is only for special work case scenarios where it is needed to overwrite the software's default data allocation system. Replace with latest clocking (as per picture below) - When you click this checker, Ingress will replace any clocking data with the latest clocking data after the download process. It is recommended to check on OUT and DONE columns only because Ingress will always check the latest OUT time of the users and will publish it in the attendance sheet. For example, the employee performs clocking at 16:30 and verified his fingerprint at the door to exit the premises. The software will use the transaction data 16:30 as the OUT time. Even if the employee subsequently comes in and finally exits at 17:00, the software will still use the transaction data 16:30 as the OUT time. 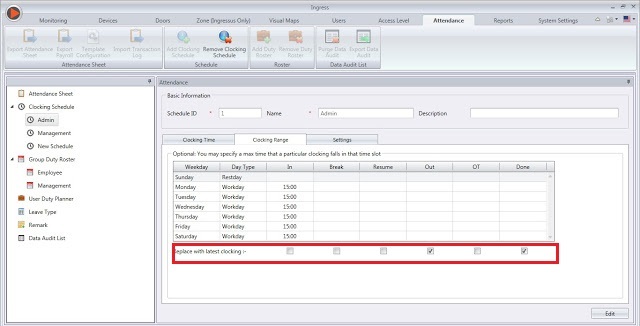 If you tick the Replace with latest clocking checkbox at the OUT column, the Attendance Sheet will display the latest transaction data which is 17:00 instead of 16:30. Clocking schedule and clocking range set up is quite difficult. May be you should do a video and give illustrations of a typical company example of activity. Referring to your inquiry, we are also providing the video guide on how to configure the clocking schedule. You may refer at the following link for TCMS v3 clocking schedule video guide.